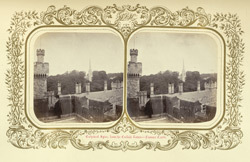 View from Lismore Castle showing "the graceful Spire of Lismore Cathedral from the unfinished top of Carlisle Tower. An ancient circular tower and other parts of the Castle are seen beneath." Lismore Castle "was originally built on the site of the Abbey of St. Carthage by King John, when Earl of Moreton, in 1185...It became for ages the residence of the bishops of the see, until Miler Magrath, Archbishop of Cashel and Bishop of Lismore, before his resignation in 1589, granted it to Sir Walter Raleigh...From Sir Walter Raleigh it was purchased by Sir Richard Boyle, afterwards Earl of Cork, who added much to its beauty...From the Earls of Cork and Burlington it descended to the Dukes of Devonshire." Extracts from 'Stereoscopic Illustrations of Clonmel'.